Still haven’t thought of a name for this guitar yet. 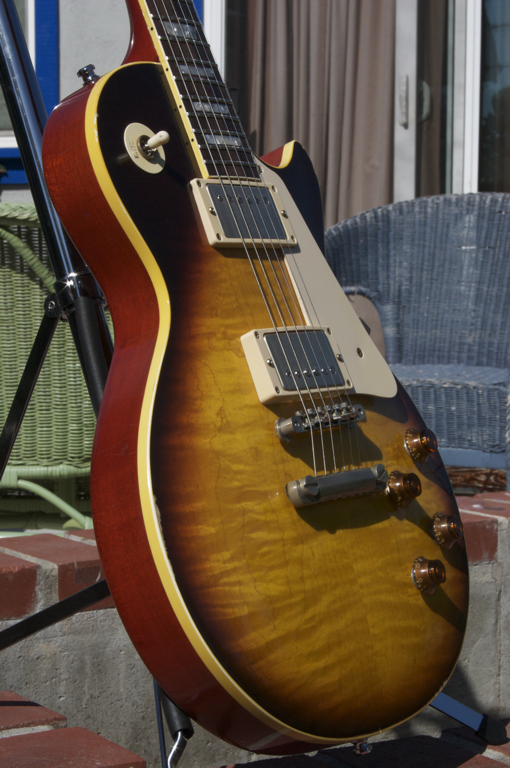 Might call her “Smokey” as she bears a tobacco sunburst finish. I’ll think of something. In any case, awhile ago, I wrote a song called “Strutter” that featured a couple of guitars and amps: My CV Tele and Gibson Nighthawk Re-issue; and my Aracom PLX18 BB and Aracom VRX22 amps. Out of curiosity, I wanted to see how the song would sound with just the ’59 replica and a single amp, my PLX18 BB. The verses are played in the neck position of the ’59, while the refrains are played in the bridge. The contrast between the two pickups is incredible. I had the amp absolutely cranked, but because the pups are not really high gain, they drive the amp nicely, but maintain a real smooth texture. What a combo! I like how you switch the pickup selection between the verses and refrains, the contrast of the 2 pickups do compliment each other well. Each being very smooth. The sum of the guitar, amp, speakers, plus your playing technique adds up to awesome tone on this one. I am big fan of your work and this is your best piece yet.